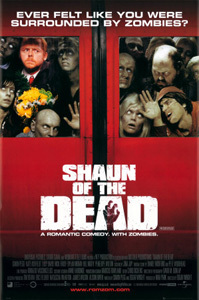 Shaun of the Dead is the best comedy horror since the Evil Dead films. This is an absolutely brilliant, action-packed movie featuring the cream of British comedy talent caught up in a zombie gore-fest. Shaun is a normal bloke living in London, trolleying along through the daily grind from work to pub to bed. He is a disappointment to his girlfriend and can't or won't shake off his best mate who is generally abusive and unhelpful. However in the event of a zombie attack Shaun is no longer the loser. He gathers his mates, girlfriend and mum together and decides to hole up in his local, while slaughtering a bunch of the undead along the way.